Ok, so it's been a while since I last blogged. My apologies. So much going on that I just haven't had time. Firstly, there is a job offer on the table for Andy. Details are still being ironed out so I won't elaborate but we're glad that it has come. We were starting to think that a trip home for Christmas might be necessary to enable us to return here for another 6 months. Secondly, Jenna has secured herself an internship with a fashion boutique on Queen Street in Toronto. Very trendy. She is very happy. Jesse is playing Michael Jackson in the school winter concert. He has been nurturing a 'fro to facilitate this and practicing his moonwalk. He especially likes to do this whilst cleaning his teeth which annoys his sister immensely as her bedroom is next to the bathroom. I should point out that the moonwalk practice is always accompanied by varying quality renditions of Thriller. Photos and hopefully a video will follow - concert is on the 11th. Can't wait. Had to buy him a black suit - just as well you can buy them here for under $20. This is hail on our doorstep a couple of weeks ago - it hailed for about 2 minutes but was incredible. By the way expecting snow very soon. Jesse is hoping for snow for this birthday next weekend. So, what else has been happening? For me, the highlight was going to Rochester, New York, USA a couple of weeks ago. A friend who invests in property there took me. We looked at houses and I have posted a few pictures for you. It was an amazing adventure and I was all hyped up when I got home sometime after midnight. Wanted to tell Andy all about it but all he wanted to do was sleep - how disappointing. House before renovation - could scare the more faint-hearted away but you know I'm not in the least bit faint-hearted when it comes to houses. What fun! Outside. This is a duplex property - note the two front doors. This house used to be painted bright pink! As you can see, they are wonderful houses, they just need some TLC. You can buy these houses for incredibly cheap prices and the rate of return is amazing. You can see where I'm going with this. Next week Michael (our friend) is taking Andy and I back so that Andy can have a look. Should be fun. On Saturday, we attended a Marlies (Toronto ice hockey team) game. 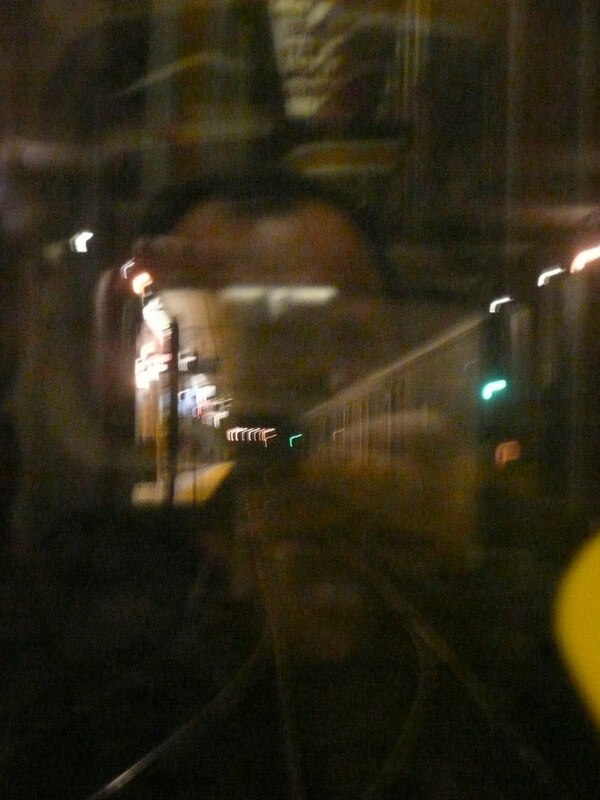 We took the subway into Toronto - just like you see on the movies. They come along every 5 minutes and they go incredibly fast. This is the track out the front window - sorry it's so blurry. 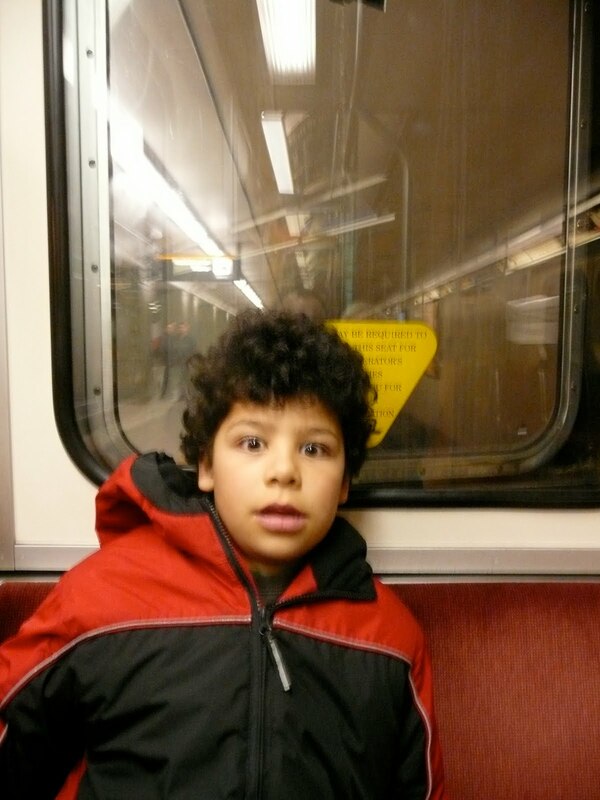 Jesse's first subway ride - don't worry, he's not nearly as scared as he looks - in fact he thought it was rather boring. After the subway, we caught a bus and then a street car to the stadium. OK, so I didn't take this photo but you get the idea. Well, I think that's all the news for now. I haven't had any comments on my blog for ages - is anyone still reading it?? By the way if you want to see all the photos I've taken, you can look at them at the Mobileme gallery as usual.